Kids are back in school from spring break and I finally had the chance to go out and do some thrifting!! I also stopped by our local antique mall, and I am so glad I did because I found this adorable cardboard chest of drawers with vintage wallpaper for a great price!! 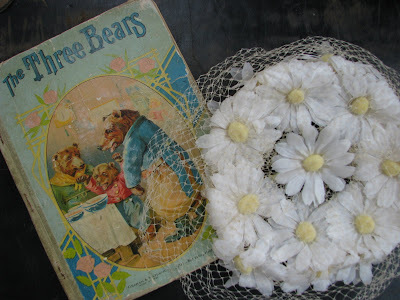 I also found a darling floral hat and a vintage childs book (I just loooove the old illustrations!!). 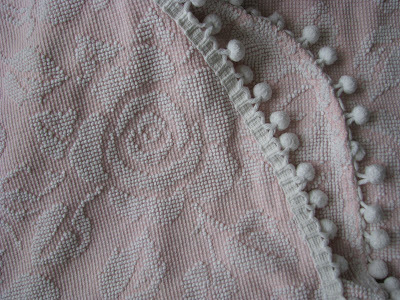 This great chenille bedspread was a thrifty find, this pattern is always very sought after!!! This great coffee table was just waiting for me at the thrift store!! I have to make a confession!! My friend Jeanne and I love to go thrifting together, and combine savings by using her senior discount (sometimes as high as 40%!!). I give her a ride and she shares her discount! 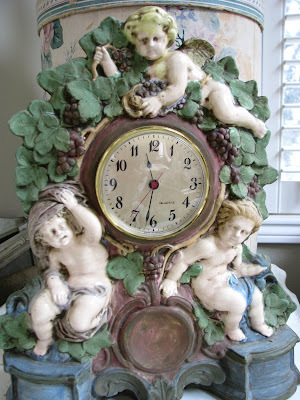 I love cherubs, and couldn't resist this massive clock!! It says Newell Studios on the bottom... Never heard of it, have you? I was thrilled to find this adorable victorian.... Okay, I have to admit I do not know the name of this in English! Help, please!! 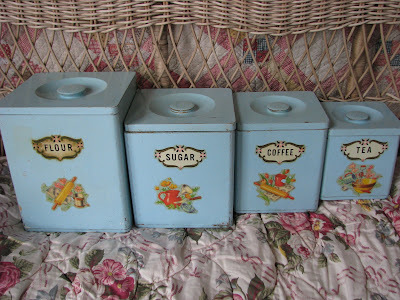 And finally, how adorable is this set of vintage kitchen canisters? They are made out of wood and have a Japan sticker on the bottom. I love it!! Thank you for tagging along with me while I shared my latest finds!! I will be back soon with more vintage goodness!! I too have had great luck at the local antique mall the last couple of weeks. I didn't see that great chest though. Love the coffee table too! Thanks for sharing. Great finds! just love the little chest of drawers, and the bed will look great once you have shabbied it up a bit. Fire Bellows, is what you are looking for, used to get the open fires going in drafty old English houses! Your finds are always incredible! Love them all, especially the coffee table and chest of drawers! You always find the best goodies!! I love the wallpaper covered drawers and the coffee table!! Great finds, Isabel! I used to have the same chenille bed spread in light blue & pink;- was very popular on EBay a few years back (when I was a seller) & I made scores of pillows & throws from it! You did a catch with the wood bed. So adorable! Wow, love everything...but especially that white coffee table. Hi - I found your blog through following links - it's terrific! I believe the article you were trying to find the name for is fireplace bellows. I have my eye on a wallpaper drawered "thingy" at a shop too, but don't know if the $28 price is too high----what's your take? love, love the coffee table! great find! lookV like you had a fabulous birthday! Happy belated birthday wishes to you Isabel! 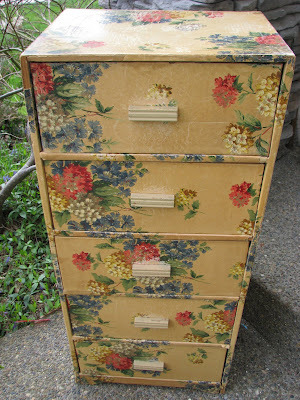 What some great things you've found, I love the little chest of drawers sooo pretty. 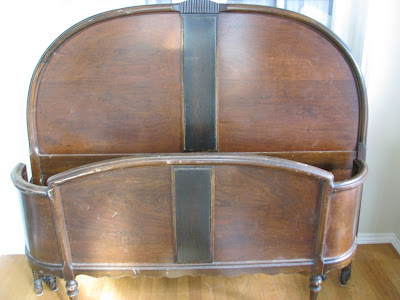 I think the bed will look great with a bit of shabby paint treatment and some pretty fabric. I love the chest!!! Wish we had an antique mall that had those kind of goodies! Awesome stuff! I can't wait to go flea this weekend!! Having a giveaway if you'd like to sign up! Hello! 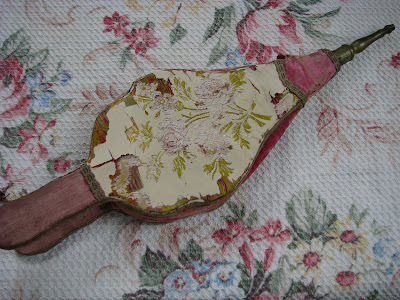 Yes, your mystery item is called a bellows - but what is it in your other languages? Wow! those are some amazing finds. Love the table. And that bed would be so gorgeous painted with fabric panels. Looking forward to what you do with it. OH my!! I am never disapointed when stopping by to see you!! Would this local antique mall be Monticello Antiques? I love that place! Actually, Rochelle, the local antique mall is right here in Sherwood, where I live!! Obviously, I absolutely looove Monticello, as I have a booth there!! I LOVE that coffee table and the bed. You find the best stuff! Oh my gosh! I would have totally snapped up that coffee table! Great find. Absolutly love the bed.You have such I fun blog. I love to see all the great things you dig up. You hit the jackpot with those fantastic finds! Love, love, love that coffee table. And the bed (swoon)...that's a beauty. What great finds; you always do get good things. The coffee table is really cute, and can only imagine what you are going to do with the bed. Can't wait to see! AMAZING finds!!! 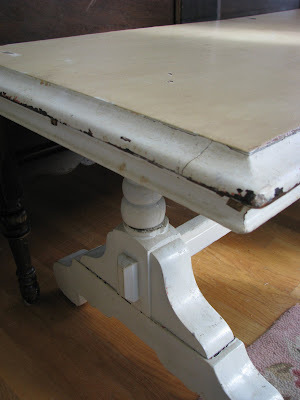 Love that white table!